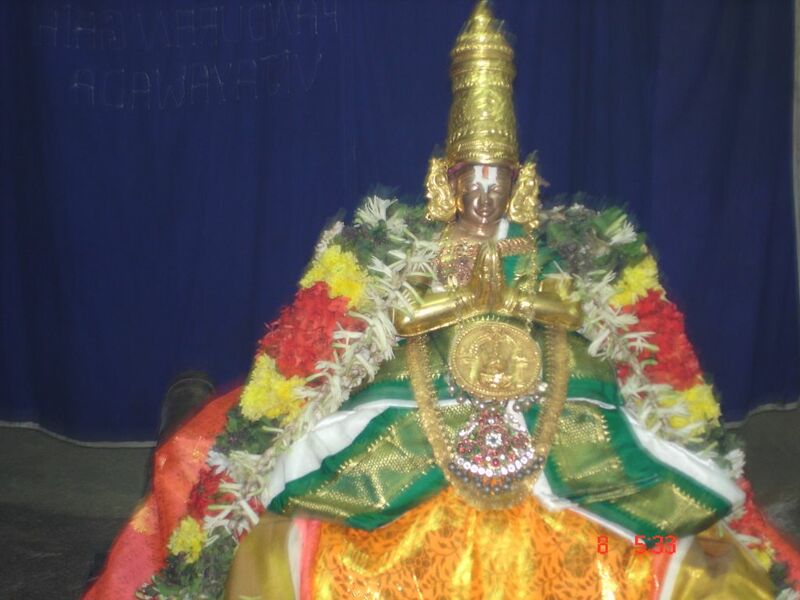 In the previous article (https://guruparamparai.wordpress.com/2012/09/17/vadakku-thiruveedhi-pillai/) we discussed about vadakku thiruvIdhi piLLai. Now we will move on to the next AchAryan in the OrAN vazhi guru paramparai. Works: yAdhrichika padi, mumukshupadi, sriya:pathi padi, parantha padi, thani praNavam, thani dhvayam, thani charamam, artha panchakam, thathva thrayam, thathva sEkaram, sAra sangraham, archirAdhi, pramEya sEkaram, samsAra sAmrAjyam, prapanna parithrANam, navarathina mAlai, nava vidha sambandham, sri vachana bhUshanam and many more. piLLai lOkAchAryar was born in srirangam to vadakku thiruvIdhi piLLai by the grace of nampiLLai (we have seen this in vadakku thiruvIdhi piLLai idhihyam – https://guruparamparai.wordpress.com/2012/09/17/vadakku-thiruveedhi-pillai/ already). He and his younger brother azhagiya maNavALa perumAL nAyanAr grew up in srirangam like perumAL and iLaya perumAL in ayOdhya and kannan emperumAn and nambi mUtha pirAn in gOkulam. They both were blessed to have the katAksham and guidance of great AchAryas of our sampradhAyam like nampiLLai, periyavAchAn piLLai, vadakku thiruvIdhi piLLai, etc at the same time. They learnt our sampradhAyam under the lotus feet of their father vadakku thiruvIdhi piLLai. Also, one of the unique quality of these two AchArya simhams is that they both took the vow of naishtika bramhacharyam and lived by that throughout their life. piLLai lOkAchAryar out of his boundless kAruNyam towards all the suffering jIvAthmAs in this samsAram and also out of the order he received from periya perumAL in his svapnam, wrote many granthams to reveal the most valuable meanings of our sampradhAyam which was mostly done through AchAryan to sishyan on an individual basis. 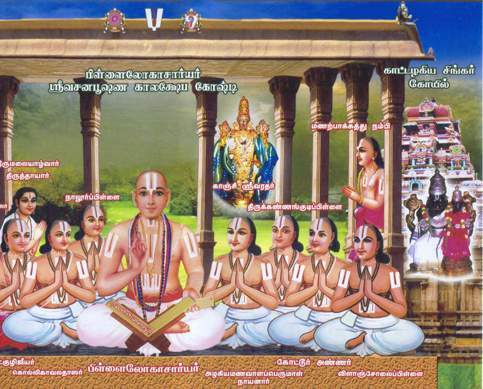 piLLai lOAchAryar became the leader of our sampradhAyam and he was teaching to his disciples regularly in srirangam. A srivaishnava named maNappAkkathu nambi went to dhEvaperumAL and dhEvaperumAL gives him valuable instructions on our sampradhAyam. But dhEvaperumAL without fully completing the instructions tells nambi to go to srirangam where he will continue to teach the same. When nambi travels to srirangam and arrives at kAttazhagiya singhar temple, he sees the kAlakshEpa gOshti of piLLai lOkAchAryar. Hiding behind a pillar, he starts listening to piLLai lOkAchAryar and is amazed to hear that he is hearing the same thing and continuation of what dhEva perumAL was teaching him. He comes out of his hiding place, falls flat at the lotus feet of piLLai lOkAchAryar and asks “avarO nIr” (Are you dhEva perumAL?) and piLLai lOkAchAryar replies “Avathu; yEthu?” (Yes, what to do now?). Thus we can clearly see that piLLai lOkAchAryar is none other than dhEva perumAL himself. Another incident is also identified in yathIndhra pravaNa prabhAvam to prove that piLLai lOkAchAryar is dhEva perumAL himself. piLLai lOkAchAryar during his final days at jyOthishkudi, instructs nAlUr piLLai to teach vyAkyAnams to thirumalai AzhwAr (thiruvAimozhi piLLai). When thirumalai AzhwAr visits dhEva perumAL for mangaLAsAsanam, dhEva perumAL speaks directly to nAlUr piLLai who was standing nearby and says “as I mentioned in jyOthishkudi you should teach thirumalai AzhwAr all the meanings of aruLicheyal”. mumukshupadi – rahasya thrayam is excellently explained in this grantham. mAmunigaL has done a detailed vyAkyAnam for this grantham. This is the fundamental grantham for any srivaishnava without which we can not easily understand the glories of thirumanthram, dhvayam and charama slOkam. thathva thrayam – this is also called as kutti bhAshyam (small sri bhAshyam). piLLai lOkAchAryar masterfully takes us through the three entities chith, achith and Ishvaran explaining them fully based on sribhAshyam. Again, without mAmunigaL’s vyAkyAnam we cannot fully understand the glories of this grantham. srivachana bhUshaNa dhivya sAsthram – this grantham is fully written using the words of AzhwArs and AchAryas. This is the magnum opus of piLLai lOkAchAryar and is a detailed grantham explaining the sath sampradhAya arthams. This brings out the inner meanings of our sampradhAyam which is magnificiently explained by mAmunigaL in his vyAkyAnam. ThirunArAyaNapurathu Ayi has also done a vyAkyAnam for this grantham. srivaishnavas must hear these granthams as kAlakshEpam at least once in their lifetime to fully appreciate our sampradhAyam. The greatness of piLLai lOkAchAryar is that, he documented these granthams in simple tamizh (maNi pravALam) language which can be understood by anyone who has the desire. Looking at the difficulties of mumukshus in understanding the sacred sampradhAya meanings, he mercifully documented what he heard from his AchAryas – all the meanings that are seen in his granthams can be directly seen in pUrvAchArya vyAkyAnams like eedu 36000 padi and vyAyAnams for other granthams by our pUrvAchAryas (before piLLai lOkAchAryar). He mercifully consolidated them and gave them in simple granthams written in simple/crisp language. Thus we can understand that he was the main AchAryan who did pramANa rakshaNam (protecting/nourishing the knowledge base). Not only he did pramANa rakshaNam, he was fully involved in pramEya rakshaNam (protecting/nourishing emperumAn). When everything was going good in srirangam, suddenly the news of muslim invasion spread like wild fire. Everyone got very worried since these muslim kings are well known to target temples for the abundant wealth that are in temples. So, immediately piLLai lOkAchAryar (being the senior most srivaishnva AchArya those times) took control of the situation. He instructed the srivaishnavas to raise a wall in front of periya perumAL and left with namperumAL and ubhaya nAchiArs towards south India. He was much older at that time but did not care for himself and he travelled along with namperumAL in the journey. When they were going through the forests, some thieves came and robbed all the jewels of namperumAL. piLLai lOkAchAryar was going a little bit ahead and when he heard about this he came back and the thieves being instructed by piLLai lOkAchAryar changes their mind, surrenders to him and offers the jewels back. 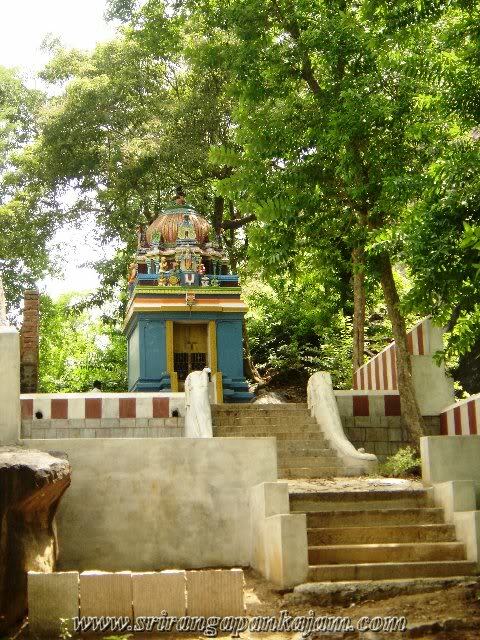 After this, they reach a spot named jyOthiskudi (near madhurai – backside of Anai malai region). piLLai lOkAchAryar due to his vayOthigam (old age) becomes ill and decides to leave to paramapadham. He thinks about thirumalai AzhwAr (thiruvAimozhi piLLai) who is one of his sishyas to be groomed to be the next leader of the sampradhAyam. He asks his sishyas (especially kUra kulOthama dhAsar) to go and relieve him from his administrative duties and reform him to be our dharisana pravarthakar. And finally he gives up his charama thirumEni and reaches paramapadham there itself. maNavALa mAmunigaL writes upadhEsa rathina mAlai to glorify piLLai lOkAchAryar and his srivachana bhUshaNa dhivya sAsthram. He explains about AzhwArs’ avathAram, AchAryas’ avathAram, emperumAnAr’s krupai in opening up our sampradhAyam to everyone who desires, thiruvAimozhi vyAkyAna avathArams, etc and starts explaining the avathAram of piLLai lOkAchAryar and the glories of srivachana bhUshaNa dhivya sAsthram and the meanings that are present in that grantham and finally says that we must live by those meanings and by doing that we will become the sath pAthram (holder) of emperumAnAr’s mercy easily. He also says without having faith in our pUrvAchAryas jnAnam and anushtAnam (instructions and pure life), if we try to create our own meanings based on our own understandings, interpretations and logic, we will only be called fools. mAmunigaL who never uses any apa sabdhams (words like fools, etc) anywhere uses a strong word (mUrkar) here to indicate the cruelty of speaking/acting without faith in our pUrvAchAryas. And this is the essence of srivachana bhUshaNa dhivya sAsthram as presented by mAmunigaL in his wonderful upadhEsa rathina mAlai prabhandham. vEdhAnthAchAryar (also known as nigamAntha mahA dhEsikan) has a written a wonderful prabhandham named lOkAchArya panchAsath glorifying piLLai lOkAchAryar. vEdhAnthAchAryar was atleast 50 years younger to piLLai lOkAchAryar and had great admiration for piLLai lOkAchAryar which can be easily understood from this grantham which is recited regularly in thirunArAyaNapuram even today. A simple English translation to lOkAchArya panchAsath written by Shri U.Ve T C A Venkatesan swamy based on Shri U.Ve V V Ramanujam swamy can be downloaded from http://acharya.org/books/eBooks/vyakhyanam/LokacharyaPanchasatVyakhyanaSaram-English.pdf. Thus we can understand the unbounded glories of piLLai lOkAchAryar who dedicated his whole life for pramANa rakshaNam and pramEya rakshaNam. Any one claiming to be a srivaishnava must have gratitude (upakAra smrithi) towards piLLai lOkAchAryar always, because without him we would neither see namperumAL nor understand the in-depth meanings of our emperumAnAr dharisanam. Let us pray at the lotus feet of piLLai lOkAchAryar that we also develop such attachment towards emperumAnAr and our AchAryan. In our next article, we will see thiruvAimozhi piLLai vaibhavam. This entry was posted in OrAN vazhi guru paramparai and tagged eedu, nayanar, pillai lokachariar, vadakku thiruveedhi pillai on September 18, 2012 by sarathyt.